The new generation of Thunderbolt, code-named 'Falcon Ridge', will be backwards compatible with current-generation cables and connectors. Intel expects production to ramp up in 2014. An on-stage demo with fresh-off-the-press silicon showed the new Thunderbolt running 1,200 [MB/sec], which is certainly a step up from what's currently on the market. 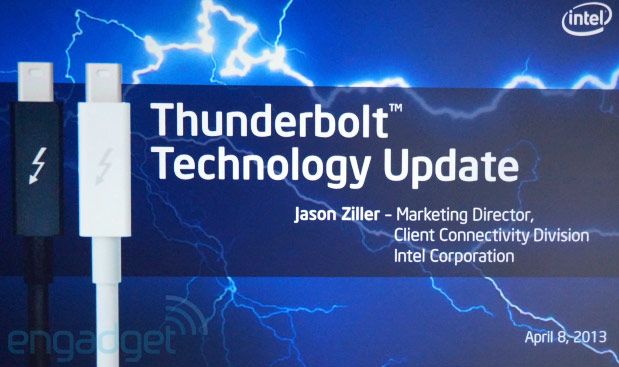 A minor update to Thunderbolt, called 'Redwood Ridge', will be included in some of Intel's upcoming 'Haswell' Core processors. So we will get faster speeds with no real devices or reasonable pricing products to use it with. Hooray. This just in, Mac Pros delayed until 2014. Or, "Why the Mac Pro won't be updated until 2014". So this means Apple can wait until next year to introduce the new MacPro. Of course, USB4 will be announced it 2015, so might want to wait for that. And Intel will have a whole new processor line in 2016, so we best not get ahead of ourselves. So, what I haven't even bough is already discontinued? the new generation mac pro debuts in December, then a refresh happens in January. Does anybody have any idea of when this might show up in the MacBook Pro line? Hopefully we'll see this in the 2014 MacBook line! That is fasssst! how are you going to connect non-TB accessories?